Gold, glitz and glam reigned the 1920s, making it the perfect decade to draw inspiration from when it comes to wedding decor. A talented team of Canadian wedding vendors, comprised of A Day to Remember Weddings & Events, Fiorire floral design, Cake by Nicole, Bean Cards and Stationery and Red Carpet Ready by Christina, were inspired specifically by “Boardwalk Empire,” using a handsome color palette of rich marsala, soft peach and lush greens, and playing with a variety of textures. And lucky for us, Edward Lai Photography was there to capture all of the details. They made the cigar station a complete experience by creating a masculine vignette using mirrors, bottles of liquor and styled placement of cigars and accessories. 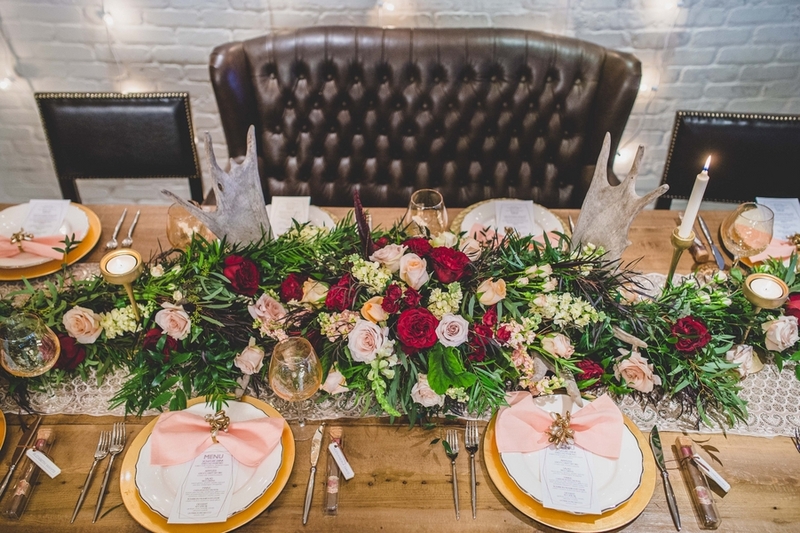 A Day to Remember Weddings & Events played with texture, using moose antlers to anchor the lush tabletop floral design while place settings were adorned with cracked metallic wine glasses and gold chargers. 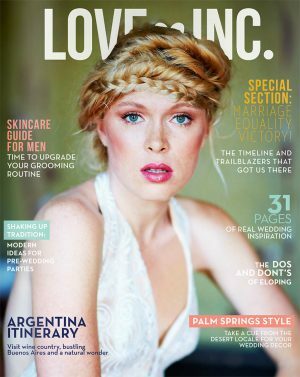 The beauty look created by Red Carpet Ready by Christina perfectly evokes the decadence of the era, with a flapper-esque hairstyle, smoky eye and deep red lip. The suit style is a perfect example of blending patterns in fashion. Don’t be shy with using different patterns for your tie and pocket square — the key to cohesiveness is to keep them within the same color family. To keep a palette from feeling too rich, include one lighter tone — as they did here with the peach — to soften it. Don’t be afraid to use unexpected furniture and decor elements such as antlers, leather chairs and filing cabinets — as you can see in this shoot, it can truly elevate the design! On a budget? The most expensive part of a cake is the decoration. Instead of covering your cake in embellishments, tell your cake designer to create one cool fondant statement either at the top or on the side, as illustrated here.